If you are looking for an easy to use eco-friendly stamp, look no further! These premium stamps do not require replacement ink pads. PSI pre-inked stamps can be re-inked and re-used indefinitely. With a simple application of a few drops of ink in the internal ink reservoir, your stamp is ready to use again within the 30 minutes! 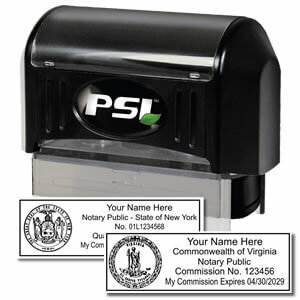 Saving the environment and making notarizing easy, this stamp is a great addition to any notary's tool kit. If you have any questions or are concerned this may not be the stamp for your needs, contact us. We would be happy to help you! 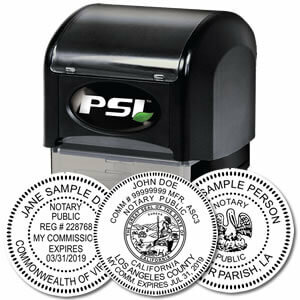 Guaranteed to have the finest impressions every time, this PSI Official Round Notary Stamp is guaranteed to be made to your state-specific standards. This product is a pre-inked stamp that never requires the use of replacement ink pad - making this not only a cost-effective way to go but also a greener way to go. Sometimes fitting your seal into a document can be difficult. That is why we designed these rectangle notary stamps to fit in smaller margins of a document. With its versatility and durability, this notary seal is a great tool for any notary. 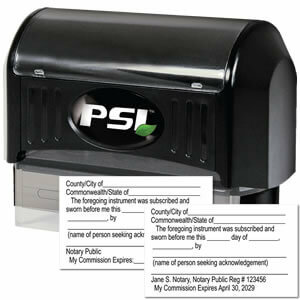 The PSI Official Rectangle Notary Stamp is 100% guaranteed to conform to state standards. Handmade with long-lasting synthetics, this pre-inked stamp is sure to make a professional impression every time it is used. As a Notary, you should be prepared to notarize almost all document. This PSI Notary Acknowledgment Stamp would mostly be used for deeds, contracts, agreements, etc. With ample amount of room to fill in your information, this stamp makes an acknowledgment of a document hassle-free. Some documents require their signer to take oath recognizing all information included within it is correct. A Jurat Stamp is a simple way to illustrate that an oath has been taken and witnessed by a notary. 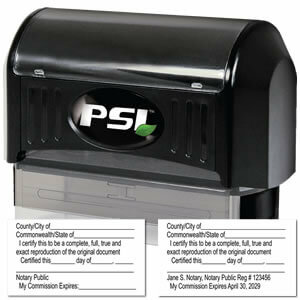 The PSI Notary Jurat Stamp is a slim, light weight and durable implementation of this traditional supplementary stamp. It is not uncommon for some states to allow a notary to make or supervise the copying of an original document. This application of a Notary Certified Copy Stamp is a green option the environment would be happy about!